The app that helps you get your spelling right! Do you need spelling and language support while writing or after you have finished, or both? 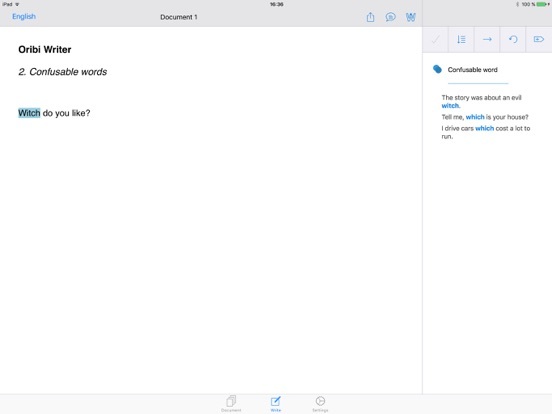 Then the Oribi Writer app is the ultimate writing tool for you. It works as a stand-alone word processor, and its spell checker and grammar checker are quite unique. Oribi Writer is specially designed for people with reading and writing difficulties and dyslexia, but it can be useful to anyone who needs a bit of spelling assistance and language support from time to time. Oribi Writer can sound out individual letters as you write them. This gives you immediate feedback on the letters that you write. -	use a large wordlist or a small one. -	text alignment (flush left, flush right, justified, centred). 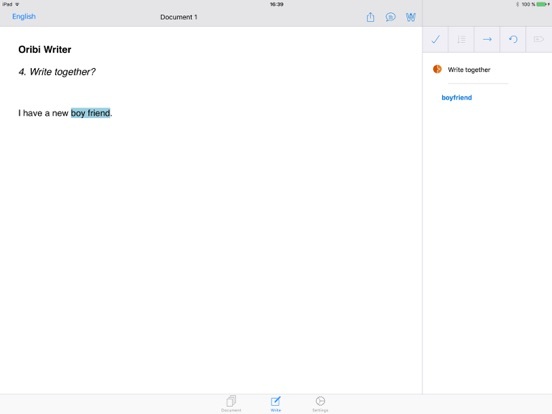 Texts in Oribi Writer can be shared to other apps, including Mail, Notes, Message, Twitter and Facebook. It is also possible to copy a text, print it, save it to Dropbox, etc. Under ‘Documents’, you can create documents directly under ‘On my iPad’. It is also possible to create subfolders and place documents directly in them. This may come in handy if you need to structure your documents or if several people use the same iPad.